Oh BABY!!!!!!! 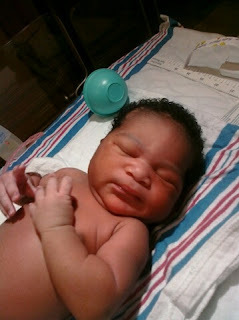 : SHE IS HERE!!!!! I am happy to announce to the WORLD that Naomi Grace Jackson arrived yesterday at 3:09pm!!!! She weighed 7lbs 7oz and is 20.5 inches long!!! She is just as cute and juicy as she wants to be and I cant wait to get my lips on those cheeks!!!! Mommy and baby are doing great and will go home in a few days!!!! Look at that face!!!!! Oh boy...Joe is gonna be in trouble when she grows up...lol.